MGM Grand Casino Five Dollar Chip ? Nearly new, but used, five dollar chip. 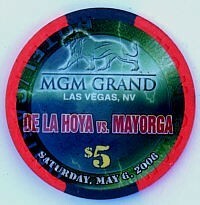 This is a special issue used for the DeLaHoya/Mayorga boxing match. Of course it still is being used in the casino also.